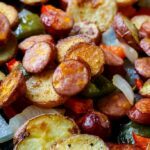 Oven-Roasted Sausage and Potatoes is an easy and versatile recipe that can be eaten on its own for a weeknight dinner or eaten as a side dish. The slices of sausage make it super filling and onions and red and green bell pepper make it a one pan dish. I love to take the leftovers and use them as an omelet filling. Unbelievably delicious!! Sausage and Potatoes makes a great meal all by itself but I also love to serve it with corn. Here is my favorite way to cook corn on the cob. I take red potatoes and slice them fairly thin, about 1/4 to 1/3-inch, and toss them with melted butter, olive oil, garlic powder, paprika, plus salt and pepper. Typically, I roast them on one baking pan and the sausage, onion, and peppers on another baking pan and them toss them together once cooked. They only take a few minutes to prep and about 30 minutes total in the oven so this is a super easy and convenient weeknight meal. 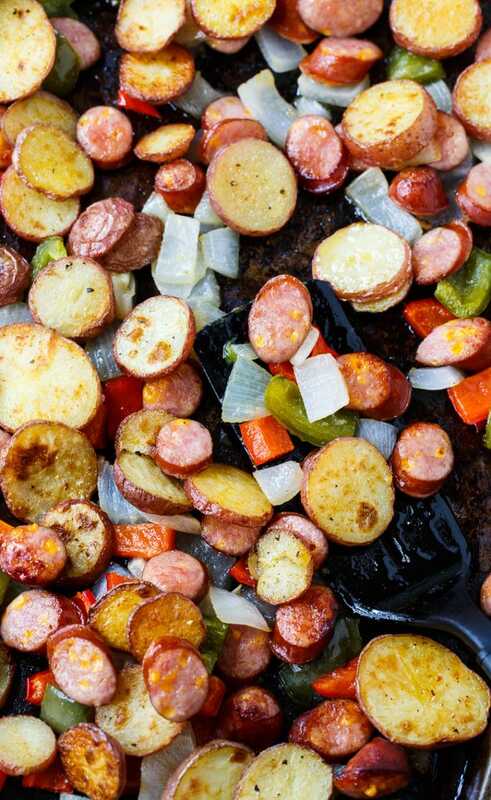 As much as I love the potato slices, it is the Johnsonville sausage that really make this recipe. My family really digs sausage and I love that Johnsonville has so many types and flavors of sausage. It keeps us from getting tired of eating sausage. Johnsonville Fully Cooked Sausage comes in a variety of flavors including Andouille (perfect for jambalaya and gumbo) and Apple Chicken which I love to add to light pasta dishes. All the fully cooked sausage flavors are so convenient and flavorful. They have no fillers and are made from 100% premium cuts of pork and have a savory hard-wood smoked flavor. 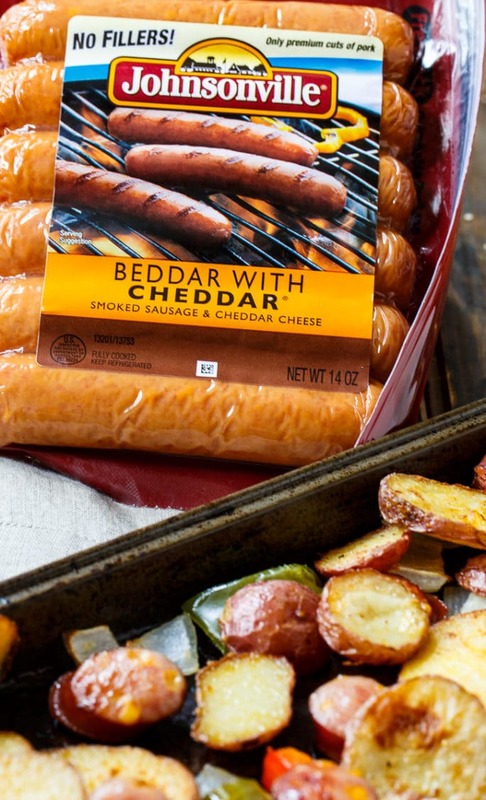 I really love the Beddar with Cheddar which is what I used for Oven-Roasted Sausage and Potatoes. Every bite has little chunks of cheddar cheese that add the perfect flavor compliment to the pork. The cheese makes the sausage ideal for adding to dishes where you want a little cheese flavor, but it saves you a step and cuts out an ingredient. So simple. So easy. Johnsonville Fully Cooked Sausage is a little bigger than a hot dog and perfect for grilling or broiling or cutting into slices and adding to recipes. 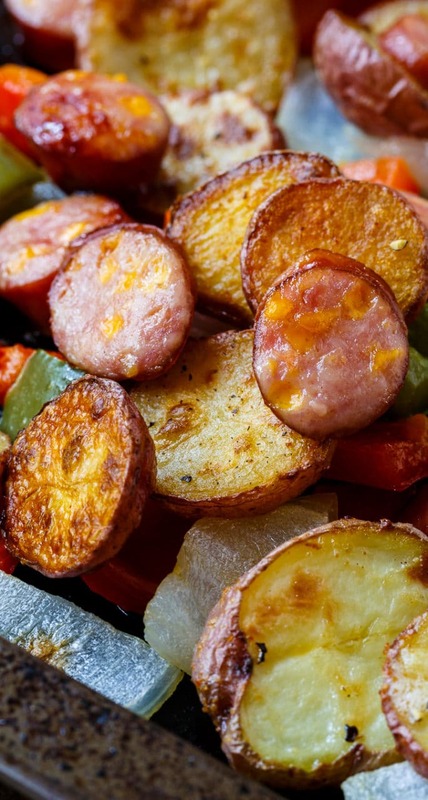 Find more Sausage Recipes at Johnsonville.com and be sure to follow Johnsonville’s social media profiles if you love sausage like I do! 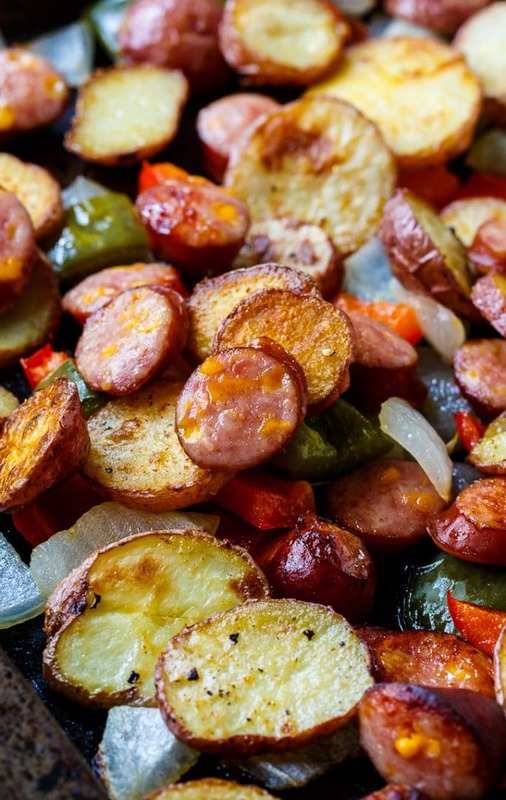 Slices of potato and sausage plus green and red pepper, and onion are roasted until golden for an easy, one pan meal. Place potatoes slices on a baking sheet, spreading out as much as possible. Combine melted butter, olive oil, garlic powder, and paprika in a small bowl. Reserve 1 tablespoon and drizzle rest on potatoes. Toss to coat. Season to taste with salt and pepper. On a second baking pan, combine sausage slices, onion, and peppers. Toss with the butter mixture that was set aside. Place in oven for 20 minutes, stirring halfway through. If potatoes do not get browned enough, place under broiler for about 3 minutes. 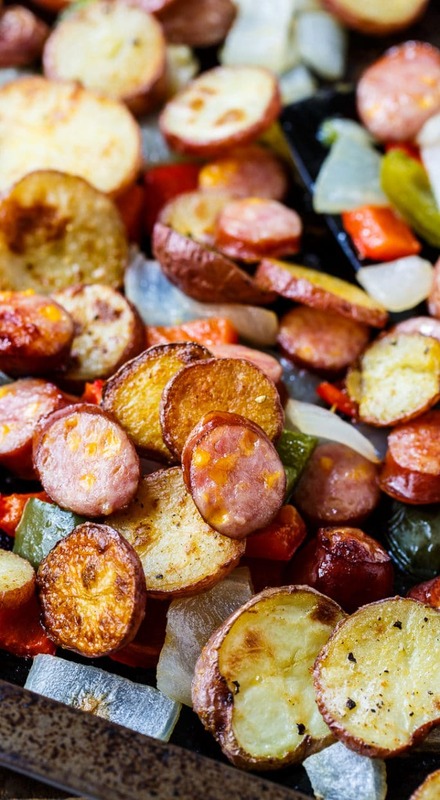 Combine potatoes with sausage, onions, and pepper and serve. This entry was posted in Side Dishes and tagged Pork, potatoes. Bookmark the permalink. Oven was too hot. I should have turned it down to 375. Maybe my oven runs hot. 30 minutes should do it. I need more easy dinners like this for busy weeknights! I love the combination of sausage and potatoes, Christin! Looks so flavorful! just add the sausage mixture after 30 minutes to the same pan or skillet and not use 2 pans. Yes, you could do either.